Home » cash » Food n Beverage » lucky » lucky draw » offline contest » purchase » qna » Red Bull » spend » WhatsApp » RED BULL Start Right, Charge Ahead Contest: Up to RM250,000 cash to be won! 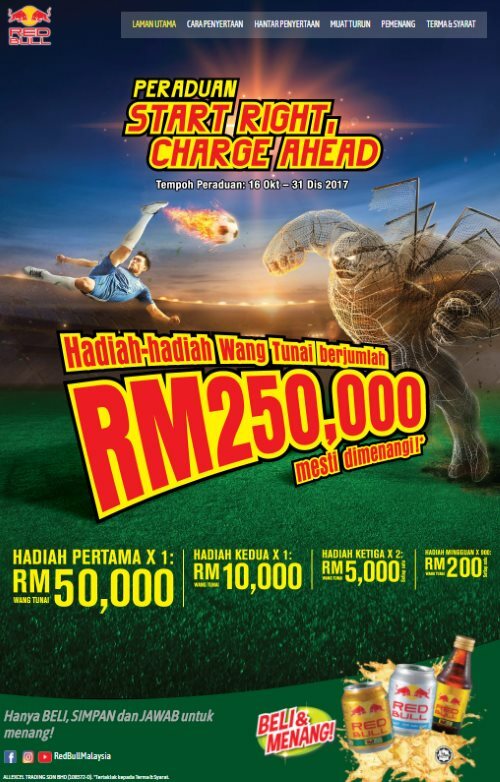 RED BULL Start Right, Charge Ahead Contest: Up to RM250,000 cash to be won! Buy any two (2) Participating RED BULL Drinks in a single receipt at any participating retail outlet during the Contest Period. Answer a question: “RED BULL boleh diminum sebelum belajar, bekerja, bersenam dan bersukan”. True / False. Submit your entry through three (3) ways: mail the Contest Form OR WhatsApp OR submit online. Visit RED BULL Start Right, Charge Ahead Contest for more details.